Re-skilling is the buzzword across every industry today as technology pushes new boundaries. In the field of surgery too from conventional methods to laparoscopy to robotic procedures, technology has been moving by leaps and bounds. How are our surgeons keeping pace? Enter Vattikuti Foundation, a US-based non-profit promoting robotic surgery in India, which is supporting the training of robotic surgeons in the country. It is doing so by way of bi-annual Robotic Surgeons Council meets, 12-month long fully paid fellowships, international travel fellowships to attend conferences, workshops and webinars. Now, in a novel approach, Vattikuti Foundation in partnership with Vattikuti Technologies, distributor of the pioneering Surgical Robots, has begun taking the da Vinci surgical robot to various non-metro cities across India, in a mobile Operating Theatre to acquaint surgeons there of this technology and create awareness on the ease of use and efficacy of this method. Raipur, the capital of Chhattisgarh, is the next city in the 20-city tour of the Roving Robot beginning next week. Chhattisgarh is among the few states in India that is not equipped with a Surgical Robot. The da Vinci ‘Roving Robot’ will be available to surgeons, doctors and hospital administrators in Raipur to view at Ramakrishna Care Hospital (July 31), Sanjeevani Cancer Care Hospital (August 1), Narayana MMI Hospital (August 2) and Indira Gandhi Regional Cancer Centre (August 3). Trained clinical team from Vattikuti will demonstrate how it works in addition to answering their queries on the capabilities of a da Vinci Surgical Robot. Not only does robotic surgery minimise blood loss, but it significantly reduces the post-operative recovery time, and brings precision in executing the procedure, thus saving healthy tissue from damage. The quick healing and lower pain-levels translate to shorter hospital stays and faster return to work than conventional surgeries. The goal in doing the robotic road show is to familiarise surgeons and hospitals administrators on how computer-assisted surgeries can vanquish various forms of cancers, particularly in the medical disciplines of Urology, Gynaecology, Thoracic, Gastro-intestinal and Head & Neck. Eminent colo-rectal surgeon from Mumbai’s Tata Memorial Hospital Dr Avanish Saklani is expected to highlight the benefits of robotic surgery in an interactive session with surgeons from Raipur and neighbouring towns on August 3. 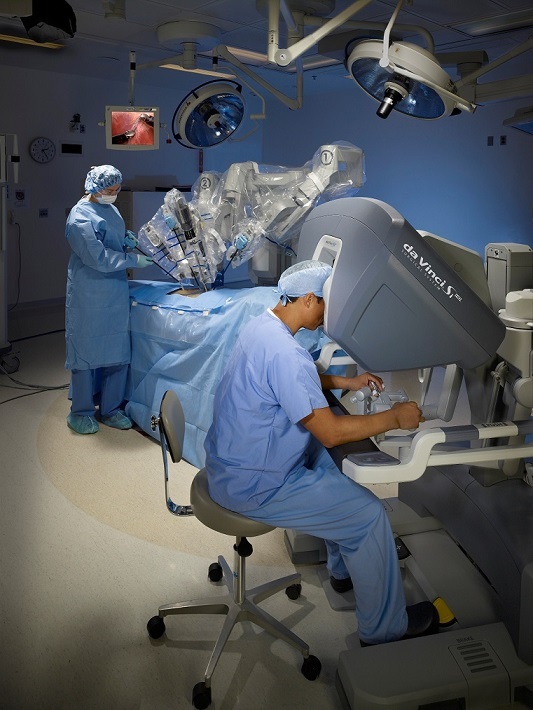 Robotic surgery is the best in class procedure for dealing with cancers as well as a few other difficult operations, training has become imperative. Dr Anupama Rajanbabu, Professor of Gynae Oncology, Amrita Hospital Kochi points out that Robotic Surgery has emerged as the preferred option for removal of endometrial cancer and other Gynae malignancies because of a sharp reduction in healing time. According to Dr N.P. Gupta, Chairman, Kidney & Urology Institute, Medanta Medicity, Gurgaon his institute is beginning a training program aimed at surgeons to equip themselves for special procedures involving robotic surgery. Since July 2016, Intuitive Surgical Inc., which is the maker of the da Vinci Robot, authorized Training and Certification centre at Amrita Hospital in Kochi has trained over 100 multi-specialty surgeons from India and neighbouring countries. This dual console da Vinci centre equipped with trained Robotic Surgeons can conduct porcine based training program for 150 annually. On its part, the Vattikuti Foundation has been facilitating international study for surgeons in India. It is evaluating scores of applications for a fellowship for practicing Indian urologists to attend the 2nd international prostate cancer symposium and Inaugural world congress of robotic urologic oncology in the United States. In 2016 it offered one-year Vattikuti Fellowships to 10 young surgeons. India has a pool of 275 trained surgeons, up from 175 a year ago, who are now acting as mentors in a bid to expand the pool of robotic trained surgeons. Vattikuti Foundation is now working on a comprehensive strategy to grow the pool of trained Robotic Surgeons in India from the current 275 to 500 by 2020. This will be achieved through Vattikuti Scholar and Vattikuti Fellowship programs. Vattikuti Foundation also hosts a bi-annual Robotic Surgeons Council meet as part of its commitment to train highly competent surgeons and to motivate young surgeons. The Foundation runs a medical student engagement program where identified Vattikuti Scholars (with a post graduate degree in surgery and a super specialization) are exposed to webinars and participation in Robotic Surgeons Council meets.